Join our Hypnobabies Community and receive 10% off of all Hypnobabies products! I had been waving practice waves for weeks, woke up Tuesday morning around 3am to waves that felt different and about 6 minutes apart. Continued my morning with my twin girls and had a chiropractor (Webster certified) appointment around 10am. After my appointment my pressure waves picked up to 3-5 minutes apart. Around lunch we headed to the hospital. I put on my Easy First Stage track for the ride. Once at the hospital I used the Peace cue during waves to direct my hypno-anesthesia and my mom or husband would use the Relax cue to deepen my hypnosis. As my pressure waves became more intense my husband would say Relax and continue to say birth prompts and affirmations to get me through! Around transformation I got in the tub. When I got out of the tub I was completely dilated with a small lip. I labored down and could feel my body pushing him down into my birth canal. Once ready my husband started the Pushing Baby Out track and I pushed for almost 2 hours. 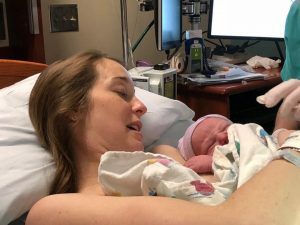 It was a beautiful, unmedicated VBAC (Vaginal Birth After Cesarean) and Weston Scott entered the world at 7:59pm. 8 pounds 1 ounce and 21 1/2 inches long.